You can get to Mykonos Island by ferry from the other islands including Santorini (3 hours by fast ferry) but the Aegean Sea can be rough and ferry trips are cancelled at the drop of a hat. Athens is the hub for flying to and from most of the better known Greek Islands, all near enough for only a half hour flight on the national carrier "Olympic Airways" or the award winning "Aegean Air". Mykonos has better beaches than Santorini with real white sand - in fact, Mykonos has some of the best beaches in Europe. The best Mykonos beach is "Plati Yialos", a few kilometres south of Mykonos town, punctuated by its Greek windmills on the beach. Like Santorini, shopping is good in Mykonos. Some of the Mykonos women’s clothes are stunning – even worn by Miss World contestants. 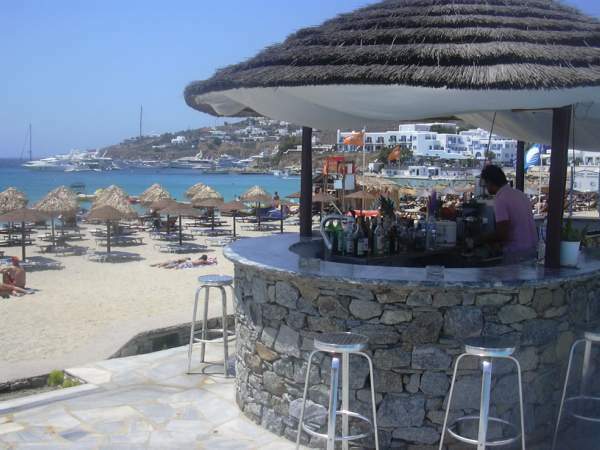 Plati Yialos is a lovely Mykonos beach with cruisers in the bay and a wooden boardwalk to tread as you choose which of the 8 beachfront restaurants you’ll try tonight. All Plati Yialos restaurants are good. Happy restaurateurs trying to entice you in as you walk past make it a colourful setting. The best Platis Yialos beachfront hotel is the "Lady Anna" on the Beach, where Anna and her daughter will welcome you with open arms. The Mykonos accommodation prices here are approximately 200 Euros a night for an ocean view room in peak season from June to September. This Pali Yialos hotel at the left hand end of Plati Yialos beach has glorious ocean views from most rooms and a beachfront pool that you hop out of near the beach. The hotel rooms are a little Spartan like many in Europe and the beds are a little firm, but hey, when in Mykonos, do as the Greeks do. Other beaches near Plati Yialos include Paradise beach and Super Paradise beach. These are brash, fast-paced places full of young couples (straight and otherwise) looking to make an impression. Paradise beach and Super Paradise beach are party beaches with bars full of rippling muscles and loud music, and if you're over 20, not a patch any more on the more serene and beautiful beach at Plati Yialos. There’s the beach over the headland near Plati Yialos where they made the movie Shirley Valentine. To this day people jump out of their taxi here at "Agios Ioannis beach", run to the little hotel where Shirley Valentine sat with her toes in the water, take a picture and run back to their waiting taxi. There are very inexpensive bus services from near major beaches including Plati Yialos beach and Paradise beach into the attractive town. Mykonos taxis are inexpensive. Just make sure you set a taxi price first, and expect the driver to pick up others on your journey and still charge you all full price. Mykonos Island is my pick of the Greek Islands for the best beach holiday. Accommodation near Mykonos is at Santorini, Athens and Alanya Turkey.